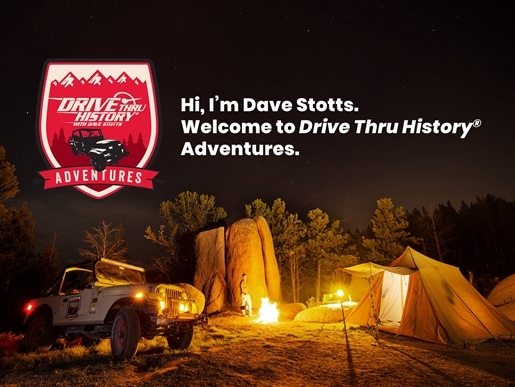 I was thrilled to get a chance to review a one-year subscription to Drive Thru History Adventures with Dave Stotts good for an entire family from Drive Thru History Adventures which also included Adventures TV which is available for streaming on Chromecast, iPhone, iPad, Android, and the PC. What is Drive Thru History Adventures and Adventures TV? Drive Thru History Adventures and Adventures TV works on a subscription. 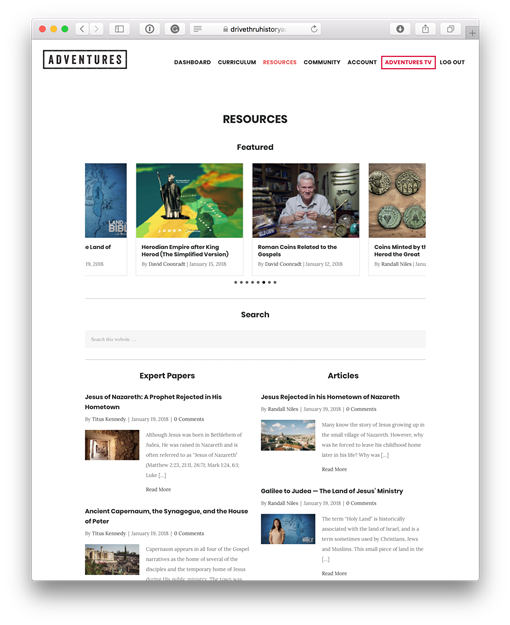 Included is an online dashboard, currently offering three curriculum options of Gospels, Ancient, and American History, resources, and community. 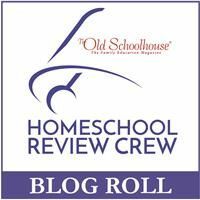 The videos alone are worth watching, but these adventures allow you to not just watch the videos anywhere, even on the go, but to also enjoy a complete curriculum of enrichment worksheets, discussion prompts and suggested readings that are included on screen or ready to print. In addition to this, the adventures format encompasses an entire community you can reach out to. Dave Stotts is passionate about presenting history and telling the truth about history, implementing the Gospels and other biblical elements whenever possible. The Adventures TV is where you can stream any of the videos. It is also a place where history is kept fresh. Yes, history is in the past, but Dave Stotts attempts to make it more than interesting by keeping his viewers up to date. 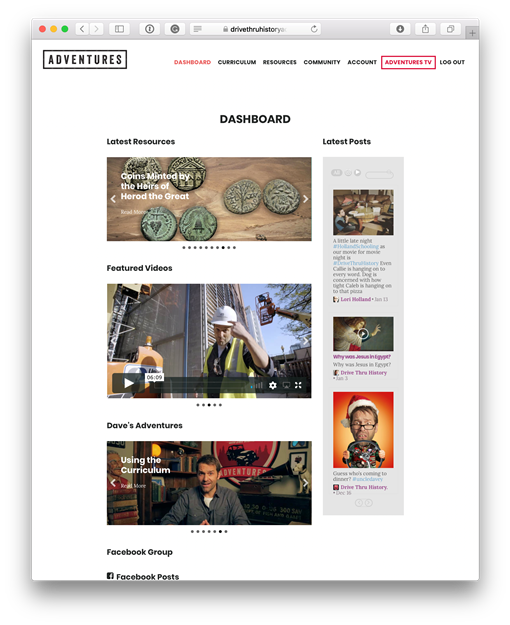 The Adventures TV area is also where you will find short videos which are frequently added and updated to keep history alive and pertinent in today's world. These videos are presented by Dave Stotts and are intended to capture your attention and keep your interest in history fresh with brief bursts of updates. He may even read and answer questions asked by real users of Drive Thru History Adventures that he received on Facebook or other forms of social media to create a sense of community. 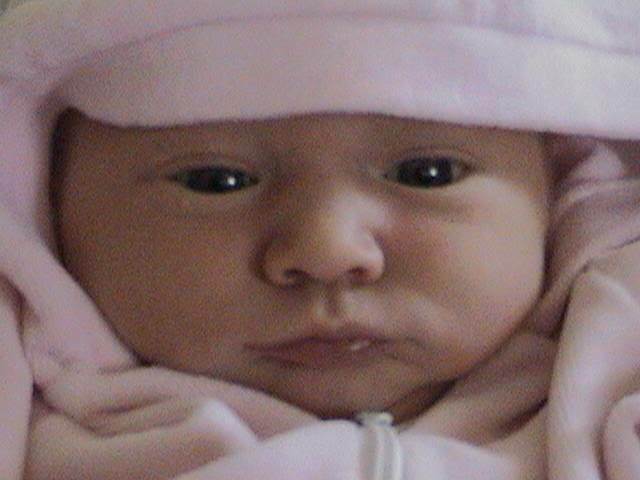 I enjoyed the style Dave Stotts presents these short video clips in what I would call a dry sense of humor, which I and my YouTube producing son absolutely love, yet authentic and heart-felt presentation. I also received email updates and really loved opening my email on Ground Hogs' day, for instance, and seeing a short clip on the history of why we celebrate it and why we use a Ground Hog instead of the original hedge hog once used. I opened it up and watched it on the go, right there on my iPhone while waiting for my son to be picked up from robotics. These clips are packed with interesting information yet won't take much of your time to watch. Each of the curriculum options are set up in a similar format where the student watches about a half hour video, followed by extra reading and a pdf worksheet. There is also an answer key and some illustrations and art, discussion questions in a discussion guide, and a dig deeper section. Bible History (18 weeks on the Gospels) - Learn the role Jesus played in history through the truth of scriptures. Follow the life of Jesus as recorded in the Gospels to learn history, geography, archeology and apologetics. Visit more than 50 locations in Isreal. Watch a half-hour video, complete readings of mostly the Gospels, and complete a worksheet with discussion questions. Included is an on-screen version of the biblical excerpts, but you are encouraged to read your own Bible as well. 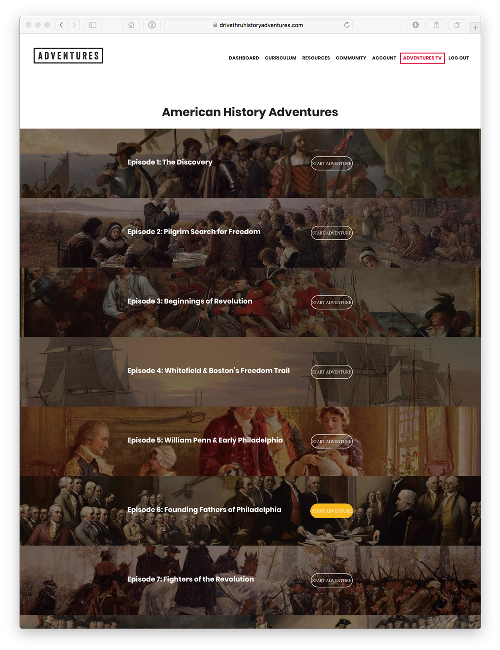 American History (12 weeks on early American history) - Dave Stotts focuses on Christian worldview, character, and courage as he covers history of the US from Columbus to the Consitution as he travels through Europe, Virginia, New York, Boston, and Philadelphia. You watch a video, read, and complete a worksheet with discussion questions. 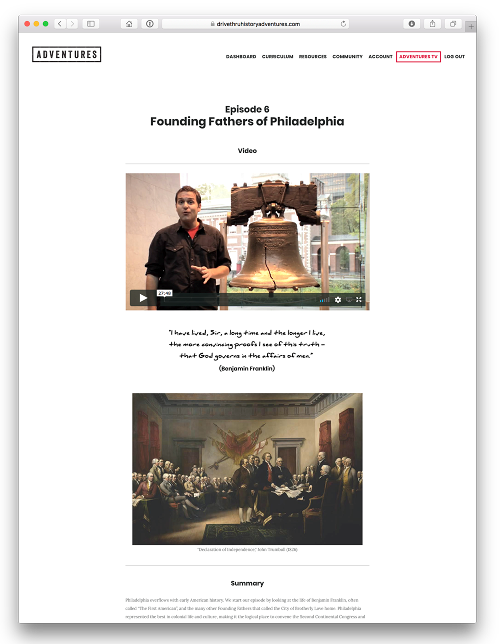 Excerpts of the Mayflower Compact, The Pennsylvania Charter of Privileges, The Declaration of Independence, the Constitution, and excerpts from speeches, letters, and sermons in a printable pdf format and online reader. Ancient History (12 weeks on early Greece, Rome and Asia Minor) - It is filmed on location, visiting Rome, Athens, Corinth, Constantinople, Delphi, and Ephesus. It includes a video, reading, and worksheets. It covers perspectives from Virgil, Homer, Plato, Cicero, and of course the Bible. It presents a look at ancient empires and how they influenced western civilization as well as the rise of Christianity. Coming Soon: There is a new Bible History covering Acts coming soon. To my surprise, we also received a package with extra goodies including two patches, two stickers, and an autograph photo of Dave Stotts. The dashboard is a place where you can keep up to date and connect with others using the curriculum. There is also a private Facebook Group that you can request access to in order to be part of the community. From there, I got to explore and decide which curriculum to focus on. I was excited about the Gospels lessons since I want my kids to have a strong background and foundation in biblical history. But, I was almost equally as excited to learn more about ancient and American History. We made a movie night setting out of watching the videos. I even popped popcorn and watched with everyone. We ended up watching almost all of the Gospels one and I also chose to focus on the American History series to learn a little more about our founding fathers and the background of America. These videos are so well done, even my highly critical high school senior commented on how well done they were. We had seen a few of the Gospel videos before but had never explored the entire curriculum offerings until now. I really like how each video is supplemented with additional readings and finalized with a worksheet and discussions. It really helps to bring home the main points even better than simply watching a video. In fact, if I had history classes like these when I was in high school, or even sooner, I may not have dreaded history so much. Honestly, I learned more from this course than I learned in my entire public school education. There is so much packed into each 30-minute video that I found myself wanting to go back and see them again just so I could catch it all. The video presentation is far from boring. Even my technological critical high schoolers thought they were well done and interesting. Of course, I really appreciate the references to Christianity. I also personally loved learning more about Benjamin Franklin. Currently, when you join with an annual subscription, you will get a set of The Gospels DVDs. Check out their website to grab your special code on the Drive Thru History Adventures Site. Drive Thru History Adventures also has a special 20% off for readers of The Old Schoolhouse® Magazine. Find it here in their latest digital issue on page 19.